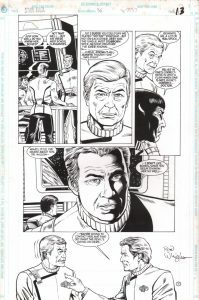 Featuring the pencils of Rod Whigham and inks by Arne Starr (who also appeared in the JJ Abrams Star Trek movie as an Engineering Officer) this original art page is from DC’s Star Trek comic series from the early 1990’s (this particular page is from issue #36 from 1992). A nice page with Kirk, Spock, and Bones on the bridge of the Enterprise, though the overall story centers around the promotion of Sulu to captain of his own ship (the Excelsior). The page measures approximately 11 by 17 inches, is in excellent condition (though does have some browning spots upper top portion) and will be shipped with the utmost care. Please note- this is an actual, original piece of artwork drawn by hand by Whigham and inked by Starr. It is not a copy, print or pre-printed image. It is a one-of-a-kind original.